Stadium of the Year 2013: Ghelamco Arena! First new stadium in Belgium for over a decade, probably the best throughout Benelux and by far the most regarded stadium in this year’s vote for Stadium of the Year. Congratulations! History of this project goes over a decade back and thanks to the determination of several entities and individuals Ghent now boasts the best stadium in Belgium, possibly best in the entire region. Also the only stadium this big built in Belgium after Euro 2000. Was this why Belgians were so determined to support it? In recent weeks fans of KAA Gent, with support of their club, passed on the news of nomination and could even read them… on the façade of the stadium. 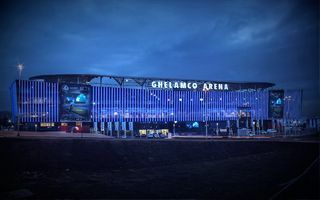 That’s right, Ghelamco Arena sits near a major highway hub and after dusk the website promoting Stadium of the Year vote, StemArena.be, was promoted through LED lighting. No wonder that Belgium provided one of the largest voter contingents this year, pushing this modern stadium to the top. Altogether 11,618 people supported this stadium, 8,903 of them awarding it with 5-star ratings! As a result – 51,024 points, a number we don’t expect to be beaten soon. Ghelamco Arena is now the smallest stadium ever to be awarded the Stadium of the Year title, but at the same time it may be the most comfortable one, too. All of the outer structure is covered in blue glass, providing enclosed and spacious promenades for fans inside. While game isn’t in play, supporters may sit on sofas and enjoy their beer, something unseen outside corporate facilities in most stadiums. Then there’s of course the LED façade and other features, the social responsibility behind the stadium and more… most of which we already wrote about. So without further undue: Congratulations, Ghelamco Arena!